It seems that 2013 is also seeing the rebirth of the clamshell type mobile phone at least in some regions, but the recently announced Samsung Galaxy Golden flip phone seems a little overpriced compared to other high end handsets. Smartphone manufacturer Samsung has been busy recently as just after announcing the Hennessy for Chinese markets the company has now revealed the Galaxy Golden. 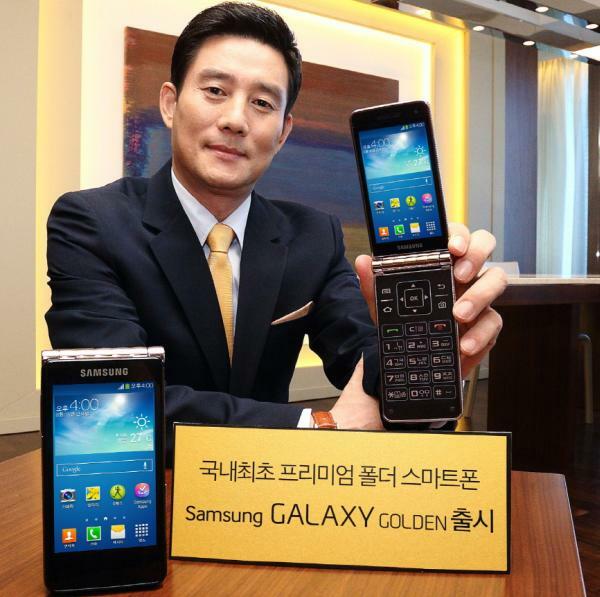 As the name suggests the device will come in a golden colour, and is being touted as Korea’s first premium flip phone. Along the lines of the Hennessey the handset is trying the best of both worlds with a traditional flip phone, but with a more modern touchscreen interface. The device is being pushed towards users getting their first smartphone and those that send a lot of emails, and other messages, and the company has provided an Easy Mode for beginners. The device features a 3.7-inch Super AMOLED touchscreen display that is powered by dual core 1.7GHz processor which is believed to be the Qualcomm Snapdragon 400, which fits in with previous rumours about the device. It will be running the Android 4.2.2 Jelly Bean operating system but its price is surprisingly high considering it specs at 799,700 won, which works out at around $715. Do you think the Samsung Galaxy Golden is overpriced? Source: Samsung via Google Translate.